written exam only for this HC Gujarat recruitment 2018. Written exam pattern and syllabus details are updated below for this HC Gujarat Class 4 posts. Written exam date is 17-02-2019 for this Gujarat High Court Class 4 vacancies. Official website to apply online for this HC Gujarat vacancies is https://hc-ojas.guj.nic.in. Exam Pattern, Call letter release date for Class 4 posts, exam syllabus, category wise vacancies are given below for this Gujarat High Court Recruitment 2018. 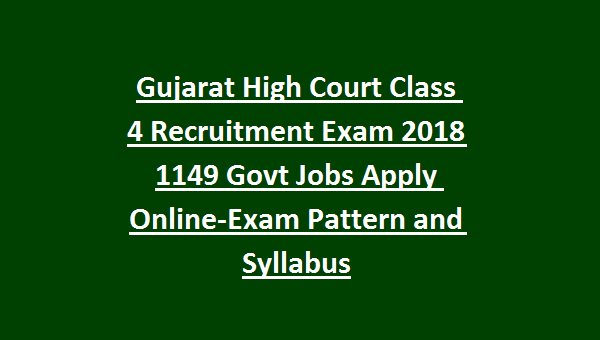 There are total 1149 Class IV jobs in this HC Gujarat recruitment 2018. As on 30-11-2018 candidates age limits are 18-33 years. For reserved candidates age limits are 18-38 years. For PH candidates age limits are 18-43 years. 10th class qualified candidates are eligible to apply online for this Gujarat HC recruitment Class 4 posts. Class IV category salary is applicable for these HC vacancies. Candidates selection will be based on written exam for this for Gujarat HC vacancies. Written exam will be conducted for 100 marks. Total 100 questions will be given. Written exam paper will be given in Gujarati only. For each wrong answer 0.33 negative mark will be deducted. 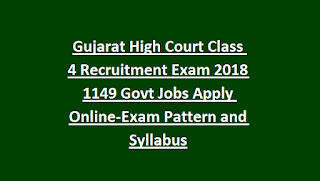 Apply online for this Gujarat High Court Class 4 posts before the closing date of 30-11-2018. Exam will be conducted on 17-2-2019 and exam call letters will be available for download from 10-02-2019. Official website to apply online is https://hc-ojas.guj.nic.in.